So, I’m about to throw a big word at you. Ready for it? 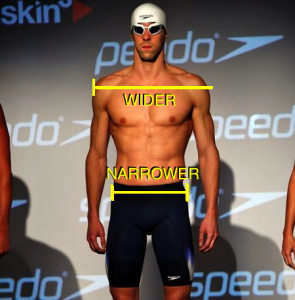 The word is defined as the “comparative study of sizes and proportions of the human body.” We can use this study to analyze what the perfect swimmer’s body should entail. Of course, it’s not just about how your body is built that matters. But also what you can do with the body you’re given. 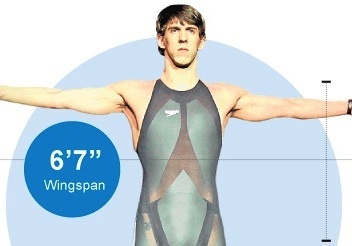 Still… Some people seem to be born with the ideal physique for the sport. For instance, one common trend is that the ideal swimmer body will have great muscle tone without being overly massive or bulky. Call them stereotypes. Or call it physics. Either way, there is a definite, clear, “Swimmer’s build.” Of course, we can’t always help our inherited physique to attain *perfection*, but we can improve our swimming in other ways. 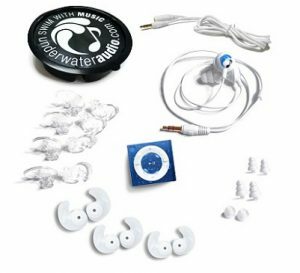 My favorite tool is my waterproof iPod and headphones from Underwater Audio, where I blast my favorite tunes while I speed through the water. The Swimbuds Sport headphones, designed for flipturns, offer excellent sound quality in and out of the water, and come with a variety of tips to find that perfect watertight seal and comfortable fit. Since the arm stroke is a crucial factor in swimming performance, there are certain specifications for the ideal swimmer’s arm. But it depends on which stroke you’re referring to. 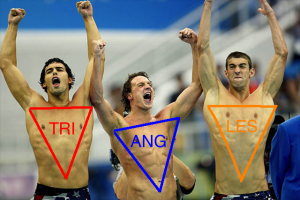 It’s said that the perfect swimmer’s upper body will look a lot like….well… a triangle. Then again, some people describe a swimmer’s physique as being V-shaped. Same theory. Supposedly, having the center of mass in the upper torso is ideal because of its proximity to the center of flotation (the lungs). This makes it easier “for the body to float horizontally with little or no effort on the part of the athlete.” If your body is not triangle-esque, good luck! 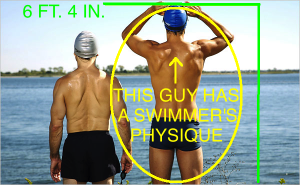 Being tall can also be an asset in swimming. It’s also effective to have a long torso and flat abs… The rationale is very similar to the difference between a long and a short canoe. A longer, narrower, flat surface cuts the water with less water resistance and creates less wake. Unlike running, where it’s actually more beneficial if you have a smaller build. However, it’s still best if the legs are lean in appearance and actual size. And the hips should be smaller and narrower. Bulk in the lower body is especially counter-intuitive to horizontal balance. Not to mention, the tapering down in the lower body is part of what adds to the triangular shape of the upper body. And it causes the center of mass to shift upward. 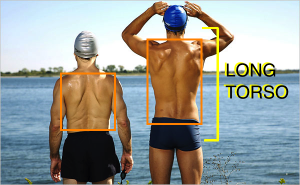 Have you noticed any other slight differences in body type that aid in swimming? We’re interested in finding out!